Dy Chairman P J Kurien said Tendulkar was nominated to the Upper House in April 2012 and has attended the session for three days. Cricket icon Sachin Tendulkar and yesteryears Bollywood star Rekha on Friday came under attack in Rajya Sabha for attending the House for only three and seven days, respectively, since their nomination two years back. P Rajeeve of CPI-M raised the issue of long-duration absence of celebrities as he wanted to know whether they have sought permission for it. Responding to this, Deputy Chairman P J Kurien said Rajeeve and some other members had raised the issue earlier but there was no violation. then the seat is considered vacant. In case of Sachin Tendulkar, he has not attended the Parliament for 40 days whereas Rekha’s absence is less than this,” he observed. Kurien said Tendulkar was nominated to the Upper House in April 2012 and has attended the session for three days. “Last time he had come to the House on December 13, 2013,” he said. On Thursday, NCP leader D P Tripathi had raised the issue outside Parliament. “I like him (Sachin) very much as a cricketer and I really like Rekha as an actress but their conduct as nominated members of Rajya Sabha is despicable to say the least. “By their behaviour and continued absence, they have insulted Parliament and Indian Constitution. Such people should have never been nominated to this august house. 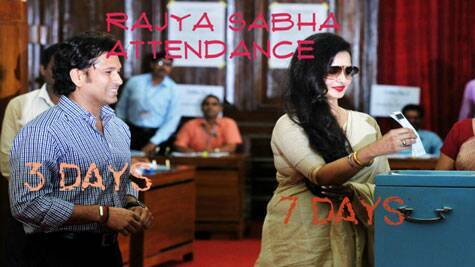 I pity those MPs who get themselves clicked with Rekha and Sachin Tendulkar,” Tripathi had said. Some other members had also expressed a desire that they felt the cricketing icon should contribute more.